Eclipse Thoroughbred Partners forms racing partnerships with the primary focus being on acquiring thoroughbreds at the elite yearling and two-year-old in-training sales along with horses that have already run on the racetrack (often in Europe) and who Eclipse believes possess “Blue Sky” potential to make a serious mark at the highest level the sport has to offer. Launched in late 2011, Eclipse maintains offices in Del Mar, CA, Lexington, KY, Franklin Square, NY, Australia and in Aiken, SC by virtue of Eclipse Thoroughbred Partners joining forces with the famed Dogwood Stable in 2013. Since its inception, Eclipse Thoroughbred Partners has been represented by eight Grade/Group I performers who have captured ten Grade/Group I Stakes. In just over six years since the stable was formed, Eclipse Thoroughbred Partners has recorded over 200 wins Including 46 Black Type wins with 22 being in Graded Stakes. This has come from 14 individual Graded Stakes winners and an additional 16 Listed Stakes winners. ETP has been represented at the Breeders’ Cup with seven starters with five placings. There have been 16 individual Grade I performers. While Eclipse has established its ability to identify, acquire, manage and campaign the “Big Horse” on a consistent basis, year in and year out, 2017 was a banner season for the partnership. Tapwrit, purchased in partnership as a yearling, became a Three-Year-Old Classic winner, proving best in the 2017 $1.5 Million Grade I Belmont Stakes in New York. He also won the Grade 2, $350,000 Tampa Bay Derby and the Pulpit Stakes and finished a game 6th after a troubled journey in the 2017 Kentucky Derby. But, Eclipse Thoroughbred Partners success has not been confined to the USA, as evidenced also in 2017 when Pinot, a yearling purchase trained by Australian icon Gai Waterhouse, captured the Group 3 Ethereal Stakes and the Group I Kennedy Oaks (Australia’s equivalent to our Kentucky Oaks) in Melbourne before being sold for high six-figures to Northern Farm in Japan as a broodmare prospect. In 2016, Illuminant, a two-year-old purchase, won the $300,000 Grade I Gamely Stakes at Santa Anita, a crowning moment to top off her Grade 2 victory in the Monrovia as well as a Listed Stakes win and a third in the Grade 1 Jenny Wiley behind the sensational Tepin. Illuminant later realized $1,100,000 as a broodmare prospect at Fasig-Tipton in Kentucky. 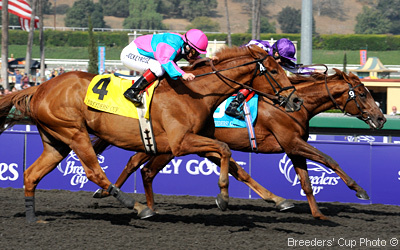 Curalina, purchased as a yearling in September 2013, captured three Grade I Stakes from 2015-2016 wearing the baby blue and black silks of Eclipse. She won the $750,000 Acorn Stakes at Belmont Park, the $300,000 Coaching Club American Oaks at Saratoga and the $300,000 La Troienne Stakes at Churchill Downs. Curalina was sold as a broodmare prospect in 2016 for $3 Million, which was the highest price for a broodmare prospect in North America the entire year. In 2014 Danza, a yearling purchase, won the $1 Million Grade I Arkansas Derby before finishing third in the $2 Million, Grade I Kentucky Derby. He was also a narrow third in the Grade 2 Saratoga Special as a freshman and now stands stud at Spendthrift Farm in Kentucky. In 2013, Capo Bastone, a two-year-old purchase, won the $500,000 Grade I King’s Bishop Stakes at Saratoga. In the same year, Byrama, a Euro import purchase, was victorious in the $250,000 Grade I Vanity Handicap at Hollywood Park in California, adding to her multiple Stakes-winning resume. During 2012, In Lingerie, a private purchase, became a Grade I winner hitting the wire first in the $500,000 Spinster Stakes at Keeneland in Kentucky. She also captured the prestigious Grade 2 Black-Eyed Susan at Pimlico and was multiple Grade 1-placed at Saratoga at age 3. At the end of her racing career, In Lingerie sold for $2.4 Million while in foal to Frankel. A national stable, Eclipse partners have visited the winners’ circle at major racetracks across the country including Saratoga, Belmont Park, Keeneland, Churchill Downs, Santa Anita, Del Mar, Gulfstream Park, Arlington Park, Pimlico, Fair Grounds, Woodbine and others. Eclipse Thoroughbred Partners prides itself on its belief that racehorse ownership success is achieved both on and off the track through a combination of winning big time races at the most desirable racing venues, as well as the lifestyle and entertainment opportunities associated with being a partner with Eclipse. Point of Honor Filly $72,375 Stakes winner Suncoast S.
Tesora Filly $64,696 Stakes winner Christiecat S.
The Tulip (IRE) Filly $60,931 Stakes winner Luther Burbank H.
Impasse Filly $19,015 Winner Glendale H.